OK so we finally have a plan for building a house. Although hubby is still skeptical that we will be able to pull it off. But I have enough optimism for two so I am SURE we can do it!!! Anyhoo, I have some dream pictures for the master bathroom. The image above represents the tile for the shower and floor. I am leaning towards a lighter brown for the floor so it looks more like sand but I LOVE the blue tile. It looks so serene and beachy! 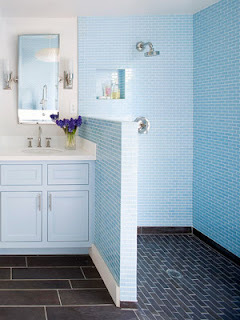 This is an image of someone's master bath in the houseplan I am totally in love with right now (see previous post). I love the windows. I am thinking a bigger tub, but I'll post more about that later. I love the fireplace in this image. I don't think I will have a fireplace in my master bath, but I think I could get one in the kids bath in the house plan. I love green and the green brick/tile in the fireplace looks so awesome. I'm also loving the shower curtain, it is sooo Romantic! I can't remember where I found these pictures, but a safe bet is BHG.com. I love that site! This image is from one of my favorite blogs http://isabellaandmaxrooms.blogspot.com. She has the best house and she decorates it so beautifully. I am totally going to steal this chandelier idea. It is so pretty sitting right over the tub. 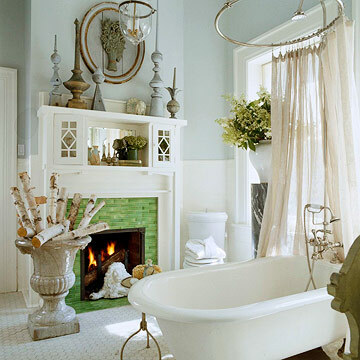 I really like the tub and faucet as well. So pretty.